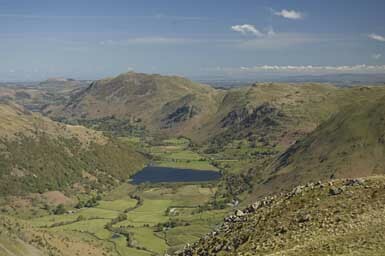 Brothers Water as seen from Middle Dodd. On the left is the fellside spur of Hartsop above How, on the right, Hartsop Dodd with Angletarn Pikes behind. Place Fell appears left of centre in the picture, beyond Brothers Water, with Great Mell Fell, to its left, in the distance. Larger version of this picture..